This is my first time at the World Youth Day and it’s been really great to meet other people from Caritas. These are people who are young like me (I’m 28), they have a job and a position of responsibility within the Caritas confederation. I run a project for women migrants who come from the countryside to Dakar. There’s often very little work in rural villages in Senegal. This situation worsens when the rainy season arrives. When women leave their villages to find work in the city, they live in really bad conditions. They often live in huts behind the market, 15 to a room, there’s no shower or toilet. Sometimes there’s just one toilet for the whole neighbourhood. It’s really difficult. These women have to do work which is hard such as millet grinding or doing washing up all day. Often their rights aren’t respected, for example their employers refuse to give them the wage they’d agreed at the beginning. They give them less money and then they get fired. Caritas approaches these women and asks them what they need. They say that if they had enough money to feed their children in the villages, they wouldn’t come to Dakar, so we set up our programme for women migrants. We help migrant women set up small businesses by giving them microfinance. We also raise awareness among the women in Dakar so they return to their villages. The women do a bit of gardening so they can sell vegetables at markets. We buy sewing machines so they can make a living as a seamstress while others become a small-scale traders, buying and selling at the market. The overall aim is that these women return to their villages, so they can live in their own houses and take care of their own children. This is what all the women want. Caritas Senegal is trying to help them gain financial independence. We’ve seen that with a little bit of economic help and some training, the women organise themselves into groups and they do just that. It’s the group that takes care of reimbursing the money. Each woman is encouraged to save so that they can invest in their own futures and be a step closer to financial independence. Some of them even get to the point where they don’t need further help from us because they have made enough money to support their own activities. This project is aimed at internal women migrants within Senegal but I often think about the wider problem of migration from West Africa towards Europe. Migration is such a complicated issue. When I finished studying, I was unemployed for two years. I couldn’t give anything to my parents. In Senegal, not being able to contribute to your upkeep is a question of honour. But migration to Europe isn’t the only solution in my opinion. Potential migrants could use the money they give to traffickers (thousands of Euros) to develop a small project in their country. This way they can contribute to their country. If you really dedicate yourself to what you’re doing and you work hard, you can really make a difference. You can even get to the point where you create jobs for others. There are some migrants who left for France, but they since returned to invest in their country. There are networks of young entrepreneurs. I really hope for a future where these young people could invest their time and talents in building Senegal. 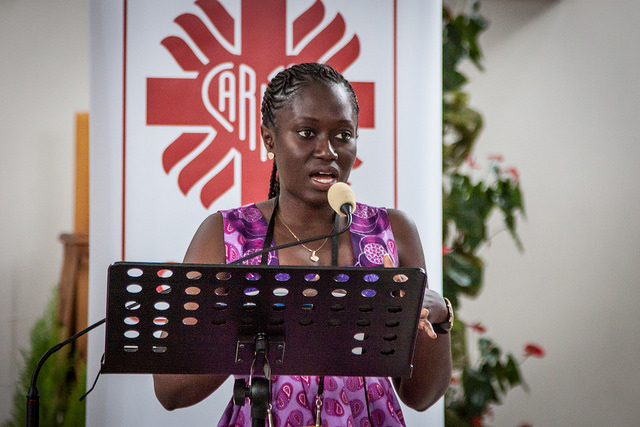 There are many young people who work in Caritas organisations around the world and I’d like to encourage them to persevere in their work and to also take the best interests of the person they help to heart. This means putting themselves in the place of others, helping them be independent so they can overcome difficulties. It means looking at others with compassion and with the love of Christ in their hearts.